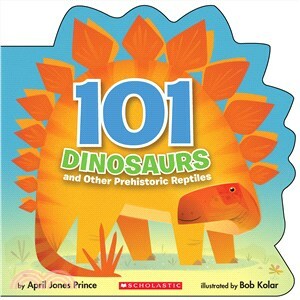 Meet the long-necks, flyers, boneheads, duckbills, swimmers, amored, horned, plated, and sharp-toothed creatures of prehistoric times in this oversized board book with 101 creatures for kids to name and sound out! With bite-size information that's perfect for this young age, phonetic spellings of each creature, and an interactive refrain, the first book in this young nonfiction series is sure to be a hit! April Jones Prince is a children’s book author and freelance editor who has worked in children’s publishing for 18 years. She holds a degree in journalism and mass communication from the University of North Carolina at Chapel Hill and a certificate in publishing from the Radcliffe Publishing Course.She currently edits and represents children’s book authors and illustrators at Studio Goodwin Sturges in Providence. When not working with clients or RISD students on their book projects, she speaks at elementary schools and writes at her home in Massachusetts. She is the award-winning author of nine books for young readers, including Twenty-One Elephants and Still Standing and What Do Wheels Do All Day? Bob Kolar grew up in a little town outside of Cleveland called Grafton, Ohio. He studied at Columbus College of Art & Design and Syracuse University. He moved to Missouri to work at Hallmark Cards. He currently works as a full-time illustrator.